LDA Anubhuti Affordable Housing Scheme 2016: Lucknow Development Authority has come up with new affordable housing scheme 2016 under Aliganj Yojna at sector-CS. This time the authority has launched two new affordable housing projects: Anubhuti Affordable Awas Yojna and Srijan Apartments. 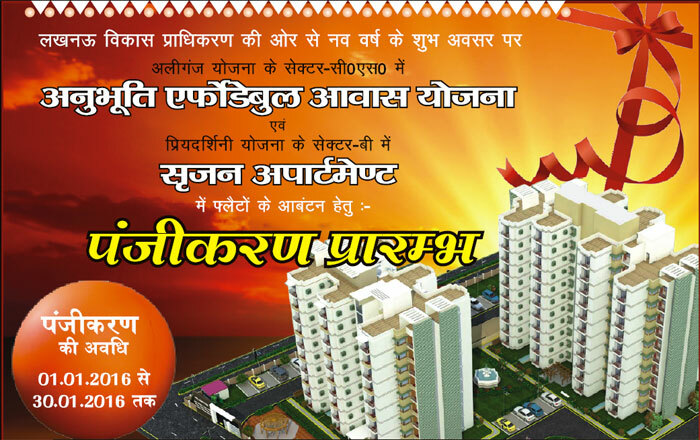 Anubhuti Affordable Housing Scheme 2016 is launched under Aliganj Yojna at Sector-CS, Lucknow. Under the Anubhuti Scheme, total 128 housing units are being offered by the authority and the applications for the the are offered through offline mode of registration from 1 January to 30 January 2016. Flats under the scheme are available in G+3 type building and estimated super area covered by a unit is around 48.45 square meter. The estimated cost of single units is about Rs. 22.14 lakh and the registration amount for the same is 5% of estimated cost of flat.